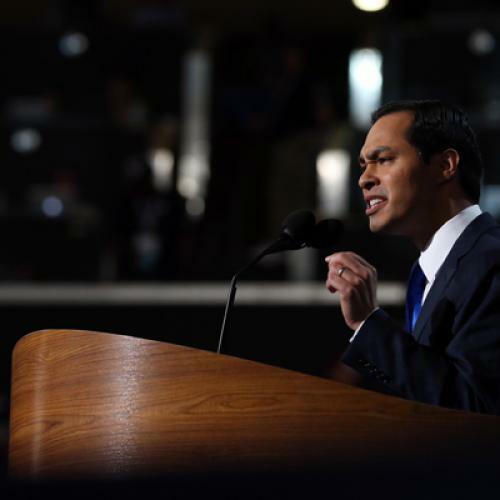 CHARLOTTE—The prime time speeches that Julian Castro and Michelle Obama gave on Tuesday evening were full of warm, endearing personal details—whether it was Castro talking about his grandmother working as a maid or Obama talking about her father struggling to pay her college bills. But these personal stories had a clear and—in the case of the First Lady’s speech—surprisingly edgy political message. Politicians from both parties talk about uniting America. But, to simplify things a bit, this election is really a debate about how to divide America. The Republicans are trying to drive a wedge between the middle class and the poor. The Democrats are trying to drive a wedge between the rich and the middle class. The Republicans talk about “makers” and “takers”—about virtuous, hard-working people who pay taxes that the government, at the behest of Democrats, sends to the frequently undeserving poor. That is the point of attacks on President Obama for, supposedly, raiding Medicare to pay for Obamacare and gutting the work requirements of welfare. In the Democratic narrative, by contrast, it’s the rich taking advantage of everybody else—and seeking to destroy public services, like Social Security or public schools, on which the vast majority of Americans rely. That is why the Democrats keep hammering away at Bain Capital, Romney’s tax returns, and the draconian implications of the Romney-Ryan budget proposals. Both attacks work because, from the standpoint of the middle class—or, at least, the white middle class—each candidate and each party fit the part. Romney is a wealthy businessman representing a party whose members are disproportionately wealthy. Obama is an African-American who used to be relatively poor, representing a whole lot of non-white people who are still poor. And that’s what made the speaker selection on Tuesday so interesting: On the first night of prime time coverage, with a precious opportunity to engage the small proportion of American voters who haven’t made up their minds about the election, the Democratic Party chose as its public face a Latino and an African-American. That might not seem like an ideal way to win over the white working- and middle-class. But that’s where the message of the two speeches came in. The clear, unmistakable argument of each was that these groups, and the members of their party, believe in the work ethic every bit as much as the Republicans do—and that, unlike the Republicans, they understand hard work alone isn’t a guarantor of success. Mitt Romney, quite simply, doesn’t get it. A few months ago he visited a university in Ohio and gave the students a little entrepreneurial advice. “Start a business,” he said. But how? “Borrow money if you have to from your parents,” he told them. Gee, why didn’t I think of that? The First Lady didn’t mention Romney or Ryan by name—not there and not anywhere else in the speech. But the reference to their agenda, and to the Republican Party’s, was clear. (Michelle even defended the Affordable Care Act, in no uncertain terms.) And so was the broader message. We want to make sure you have the same opportunities we did. They don’t. Did it work? Will it make a difference? As usual, I have no idea. But the stark political message seemed entirely appropriate, given the stark contrast between the two parties and the high stakes of the election. Update: With some edits for clarity and style.